Happy Monday friends!! Who can believe that it’s February!! Come on Spring! Yesterday was an amazing Sunday – not only did the New England Patriots win the Super Bowl, but the Seattle Stylelogue hosted a Galentine’s Brunch in partnership with the PaliHotel in Seattle! More to come on this amazing event soon! Today I’m sharing a few tips on adding color to your winter wardrobe by layering winter and spring pieces to give yourself the color you’re craving! Cable Knit Sweater // Who doesn’t like a little color this time of year, am I right? 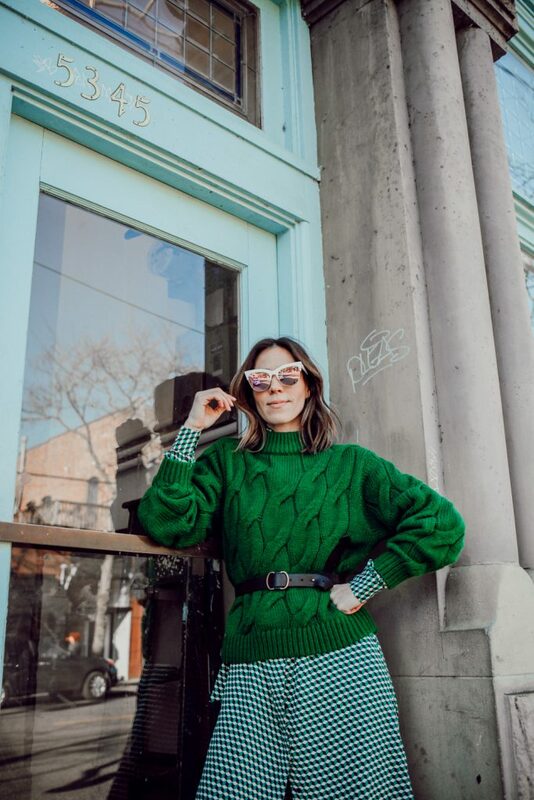 I was in H&M last week and saw this GORGEOUS green cable knit sweater and thought it would be perfect for spring! Green is such an easy go to color for spring and I find that it’s a really complimentary color for all! Geometric Shirt Dress // While it’s still winter, pretty much everywhere, I layered this geometric shirt dress from H&M underneath the cable knit sweater! Not only does the look have dimension, but it has color and texture now too! What’s great about this dress is that is the perfect work dress for both spring and summer – great to layer and great to wear on it’s own. I loved all the colors in this look and really wanted to bring them all out in my accessories! These Retro Sunglasses are the perfect pairing to this combo and adds a little bit of retro flavor! This Leather Belt came in handy when I needed something to cinch my waste – when layering sweaters with a skirt or dress, try using a belt to create a more natural waist line! AND these White Leather Booties will always be on repeat for me! They are a great alternative to a black book that would typically be my go to for winter!